You are at:Home»Lifestyle»Beauty/Fashion»Clothing Swaps to the Rescue! For all of you b usy Mizzes in the Biz, if you’ve ever fallen out of love with clothes that used to be your favorites, and wondered where to donate the goods, you’ve probably thought about Goodwill. Score for brand recognition, but there are other options: the Downtown Women’s Center in LA or Dress for Success won’t resell your items – they’ll just give them to women in need. Or you could make an awesome day of it, sharing clothes and giggles and drinks and lovefest-y compliments with lady friends, and still accumulate a mass of donation-worthy material for your local charities. Welcome to the wonderful world of clothing swaps. For those of you who’ve never participated, it’s a trend that dates back to the ‘90s officially (although I have to imagine there was some cavewoman bonding that went down bartering for loin cloths back in the day). Often these events have simple rules structuring the madness, so it’s not just clothes flying every which way – a popular meetup in England has an inexpensive entrance fee (the equivalent of $5) and operates a one-for-one policy; for every item you bring, you get a token good for any other item there. A clothing swap in San Francisco, that’s rumored to be where the craze began (sweet video here), has an even simpler system: bring stuff, get stuff. No one-to-one, no fee, no provisos except that what you bring better be in good enough condition that you’d lend it to a friend. But although these clothing exchanges are obviously great for the ol’ wardrobe, and great for contributing a bit to charity in an utterly painless but meaningful way, they’re also great for lady bonding, and creating a sense of community. Neither of the swaps I participated in this week had any rules, although the WeWork one required that we look but not grab for the first 45 minutes as people arrived, which was torturous but entirely fair. After that though, it was a complete free-for-all. No rules about how many items you could grab, or any finger-wagging if you were taking more than you’d initially brought. And no worry that clothes flying every which way was going to be too chaotic to contain. And the beautiful part? No one abused the freedom. If there was an item more than one lady lusted over, we had warned that there’d be a fashion-off or, in the case of the WeWork event, a dance-off. But it never came to that. Each lady would try on the item and it’d be totally clear who looked best in it, or who would wear it most, or who loved it on as much as off. Everyone was respectful of the items and of each other. Plus, everyone’s needs were a bit different: there was the girl looking to curb her habit of wearing only flowy things, the actress hoping to expand her costume collection, the business woman on a mission to have a more “adult” wardrobe, the LARPer nabbing the more eccentric items everyone was happy to see end up at a good home. That we could each fulfill our individual missions with zero cash made it feel a little like magic. The group would often contribute positive re-enforcement as though we were in an afternoon special: “you can totally get away with that!” and “no, it’s super flattering on your body-type!” especially lighting up when we saw our own old items anew on someone else. Those lines might seem stereotypically girly, but considering how cruel women can be to each other, it was beautifully refreshing. We didn’t all know each other, but we felt grateful and charitable just being there, and it made for some high-class pleasantries and even some effortless networking. Additionally, it seemed each member of the exchange self-regulated. No one left with fifty items (although they technically could have). If part of the fun is the recycling and purging of our own goods, in equal measure a swap like this encourages an ethos of minimalism. In other words: it seemed no one wanted to leave with a bunch of crap. 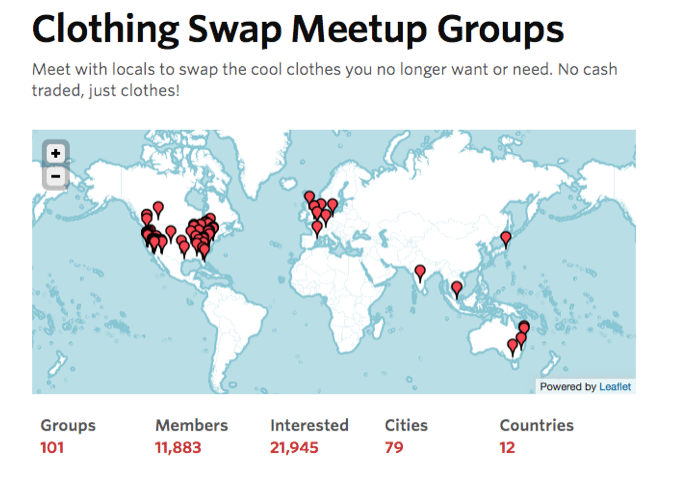 Often people connect clothing swaps with environmentalism; god knows they don’t solve every problem in the clothing industry (see sweatshop laborers), but they do provide an outside-the-box solution to the issue of waste, and turn an opportunity to give away into an opportunity to build community as well. Location: figure out a good spot to hold the swap (obviously your own living room is an easy option) and designate a dressing room in case some ladies aren’t comfortable stripping in front of the others. People: invite friends (some try to limit it to 10, some say the more the merrier), and encourage them to bring anything they’ve fallen out of love with – doesn’t even have to be clothes, though books and DVDs will likely be in the minority. Organization: get fancy and create signage for tops, bottoms, dresses, shoes, accessories… or don’t and watch as your guests organically organize their goods like Cinderella’s little helpers. Ambiance: encourage a potluck or throw down for some food and drink if you’re in a hosting mood. Music’s always nice. An accessible full-length mirror is always a plus. Duration: assume it’ll be about three hours… people won’t stroll in all at once, of course, so there will likely be a fresh wave of items throughout. Plus chatting and eating and drinking and you get the idea. I’d love to hit up one of the ones in Australia, but it’d sort of defeat the purpose of engaging in a zero cash event.